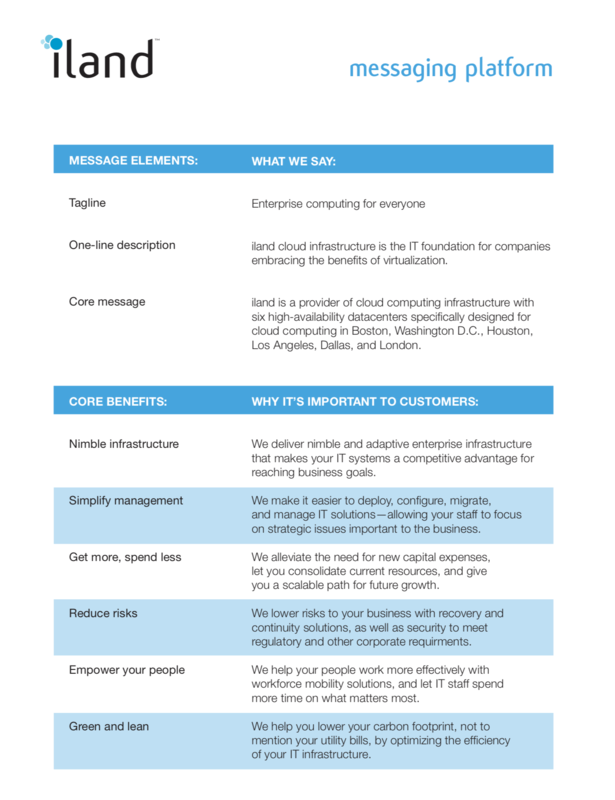 As creative director and copywriter at iland, I created a new messaging platform as part of a comprehensive rebranding effort to better communicate the IT company’s focus on cloud computing. iland provides cloud computing infrastructure through high-availability datacenters specifically designed for cloud computing in cities including Boston, Washington D.C., Houston, Los Angeles, Dallas, and London. The messaging platform covers aspects that cross different audiences, from enterprise to startup. Discussions with subject matter experts (SMEs) within the company and a variety of clients uncovered key differentiating points in iland’s service offerings. As a partner of VMware and other industry leaders, iland infrastructure enables organizations to go beyond the cloud computing buzz and realize tangible business benefits including reduced and predictable IT costs, streamlined and simplified management, and a nimble infrastructure that lets you adapt with ease to market forces and align IT with the priorities of your business. How do you plan for the unplannable? Make change part of the plan with a nimble infrastructure that lets you adapt with ease to whatever change throws your way. iland infrastructure is the IT foundation of your agile enterprise. Simplify IT management with a streamlined cloud infrastructure that lets you unify systems and increase visibility from the datacenter to business processes to end-users. iland cloud infrastructure delivers multiple solutions for meeting rising IT demands in a world of shrinking budgets. You can stay up late at night worrying, or you can make sure your IT infrastructure can protect your data and services from downtime—and your business from lost revenue. Give them the tools and information access they need to quickly develop innovative, new ideas—and work whenever wherever inspiration strikes. Servers running at 10 percent capacity make your data center 90 percent inefficient. That’s not just wasting electricity and increasing carbon emissions—it’s squandering your IT budget and complicating management.